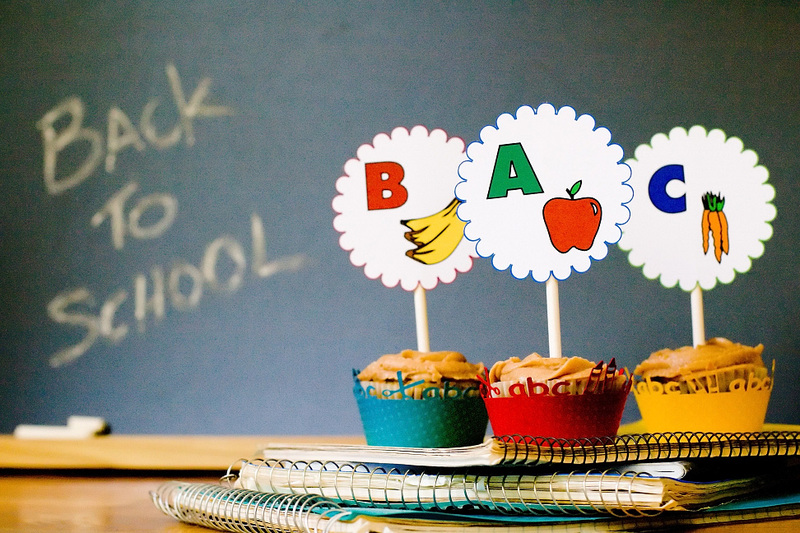 Back to school cupcakes are one reason to get excited about the school year beginning. The other reason is new school supplies; was it just me who got more excited about buying crisp new colorful notebooks and folders than back to school clothing? 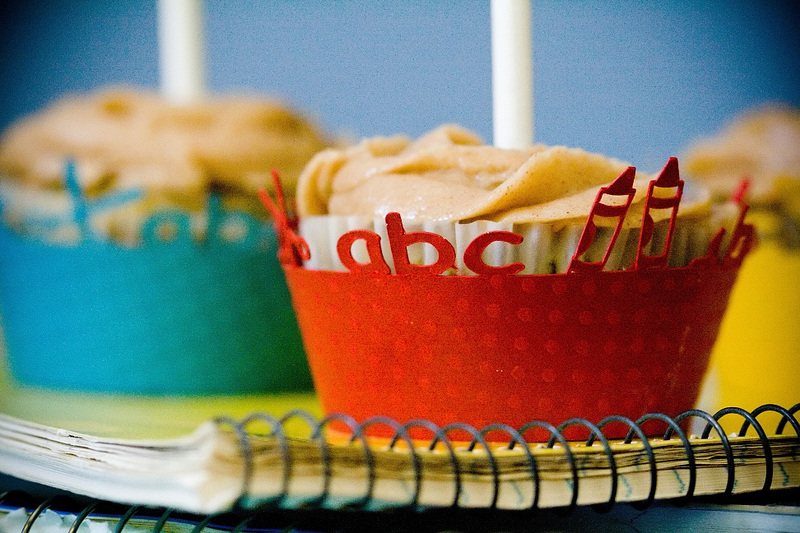 My back to school cupcakes celebrate the ABC’s – apples, bananas, and carrots. In doing so, they are almost healthy (if you ignore the butter content and leave off the frosting). I always talk flavor first because no matter how cute my back to school cupcakes look (and aren’t they adorable? ), it’s the taste that matters. The super moist back to school cupcakes taste like a combination of banana bread and carrot cake with bits of apple mixed in to remind you that Fall is coming. I didn’t want the back to school cupcakes to taste like spice cakes (I wanted the fruit to shine), so I left out the cinnamon and nutmeg that are often found in banana and carrot cakes. Instead, I introduced a little cinnamon spice by topping the back to school cupcakes with cinnamon cream cheese frosting. Now that we’ve covered the flavor of the back to school cupcakes, let’s get back to the shallow focus on looks. Then, we’ll move on to the recipe that will have your kids begging to work on their ABC’s. In addition to his skills in photography, Jonathan has some serious graphic design skills. He designed the custom back to school cupcake wrappers that you see in the photos. I don’t think it would be possible to cut the wrappers out by hand, but everything becomes possible with a Silhouette digital cutter (if you want to make them, you can download Jonathan’s ABC Silhouette wrapper file for free). Remember that you have until August 14 to take advantage of the great discount that Silhouette is offering to Cupcake Project readers. Warning: Even when using the Silhouette, cutting these wrappers is time-consuming. It takes about 15 minutes for every two wrappers. But, at least you can do something else (I hoop ) while the Silhouette does the hard work. 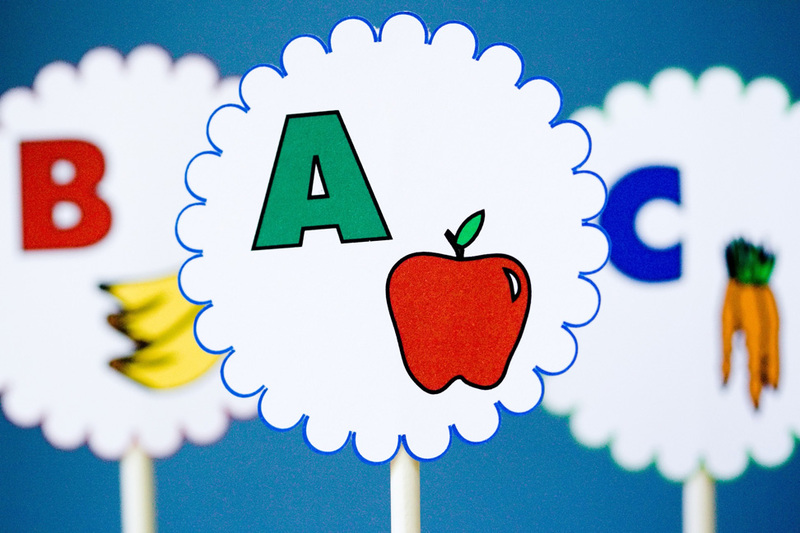 Jonathan also designed the A, B, C toppers. You can download and print a PDF of the toppers, and if you have a Silhouette, you can also download the Silhouette file to use to cut them out (if you don’t have a Silhouette, you could probably cut these by hand or use a scrapbooking punch). My back to school cupcakes celebrate the ABC's - apples, bananas, and carrots. In doing so, they are almost healthy. 1 C finely chopped carrots about 1 large carrot - It's easiest to do this in a food processor. If you use organic carrots and scrub them well, you don't even have to peel them first. In a medium-sized bowl, whisk together flour, baking soda, and baking powder. In a large bowl, mix honey, sugar, carrots, bananas, butter, eggs, vanilla, and lemon zest until well combined. Add flour a little bit at a time, mixing until just combined. Bake at 350 F for 20 minutes or until a toothpick comes out dry. 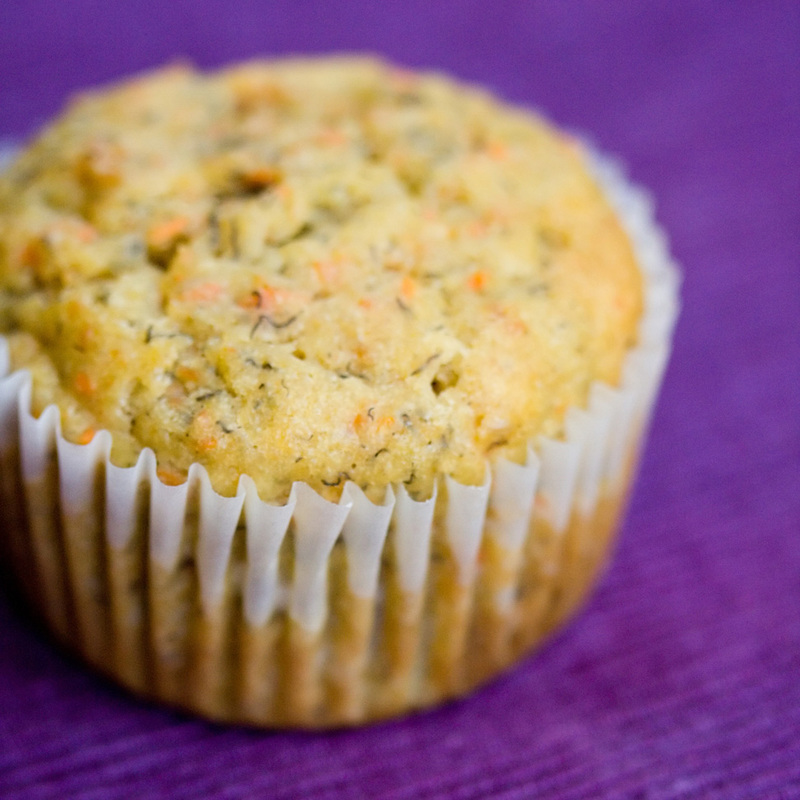 Perfect timing on this recipe, as I’ve been thinking about making some healthier cupcakes or muffins to freeze for my daughter’s lunches when school starts. These would be a great way to get extra fruit/veggies in! those wrappers are FANTASTIC. super awesome. Ooh, my friend and I made that frosting for some other cupcake you posted a while back. It’s SOOO good–I imagine it would be perfect on these, and definitely the right flavors to get you excited about fall! These look great! My daughter is allergic to bananas…would you suggest adding more carrot and some apple sauce for moisture? These are completely adorable! Too cute! Those cupcakes are so cute and it really address to those kids who love cupcakes not only them but also to everyone.Thank you for sharing. Wow! That sounds so yummy! I just have to purchase Apples, Banans and Carrots now! Katie – You could simply double the carrot and you’d be fine. Those wrappers are so darn cute! Made these for 1st day of school Monday – everyone loved them! I think I’ll make them again with the candied carrot curls on top! These are FABULOUS! I did modify the frosting a bit by using powdered sugar, brown sugar, maple syrup and pumpkin pie spice. It was INSANELY awesome. I will make these again and again and again!